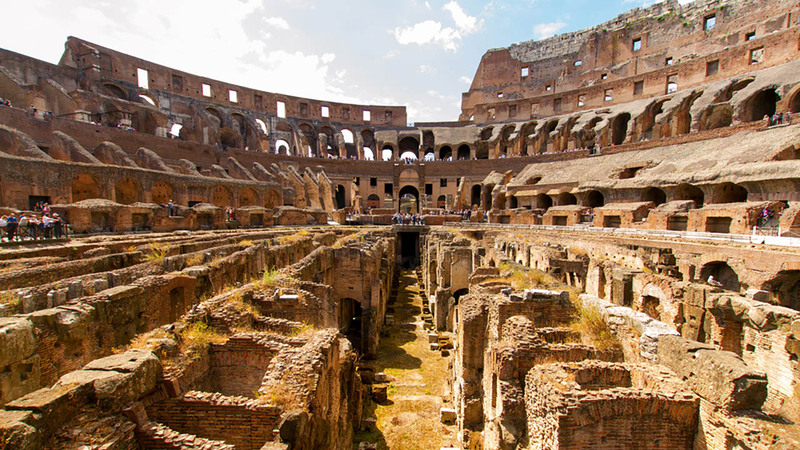 Go where few tourists have gone before with this VIP Colosseum Underground tour, taking you to closed areas of the Colosseum so you can truly experience the magic of Ancient Rome. 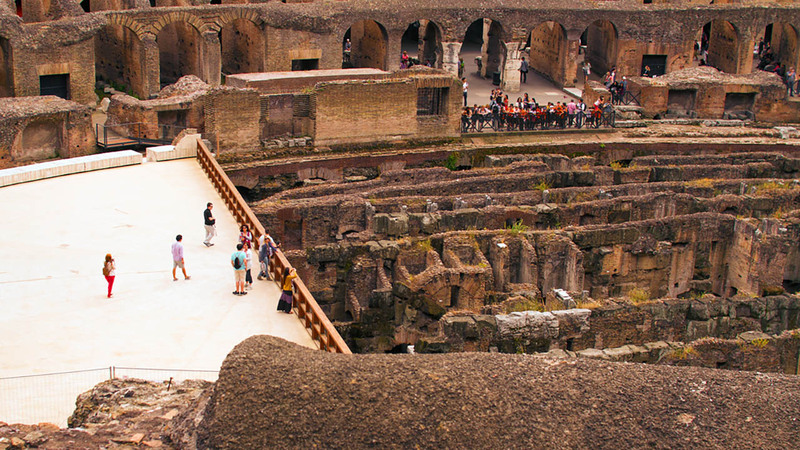 Visit the Colosseum underground & walk on the arena floor. 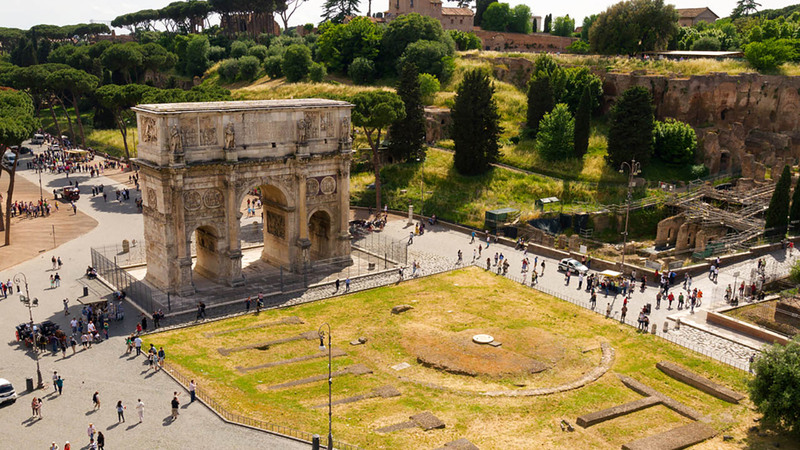 Enjoy a full tour of the general access areas of the Colosseum, Roman Forum & Palatine Hill. Feel the fear and hear the roars of the crowd above you as you enjoy this full Colosseum Underground tour. 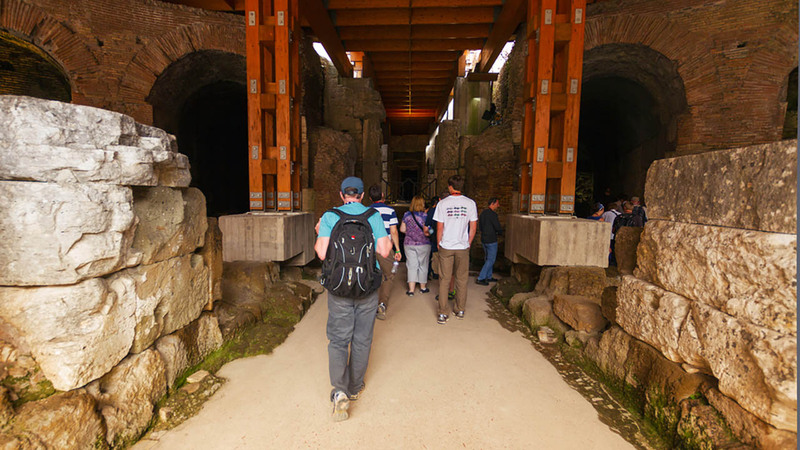 Stepping beneath the arena floor, you'll walk in the footsteps of gladiators who waited here before battle. As you tour the tunnels, your guide will tell you about the real life of gladiators before taking you back up to the arena floor. 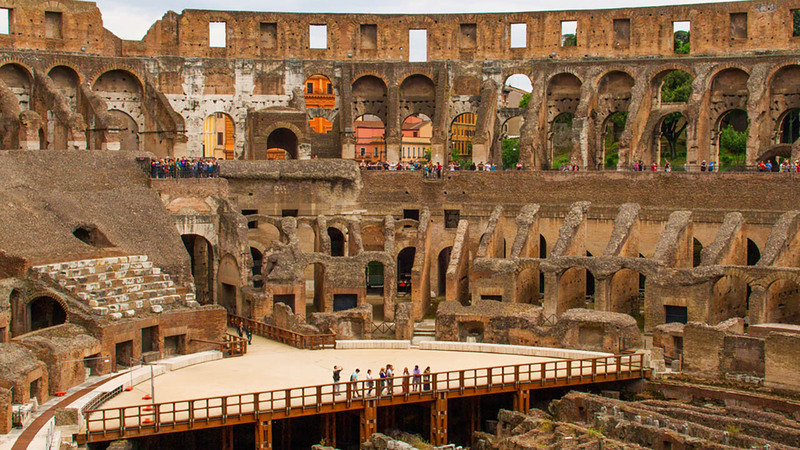 Walk out onto a recreation of the stage where the fighting took place and be blown away by the most impressive view of the Colosseum (seen by so few!). After your Colosseum and Colosseum Underground tour, you'll experience the very heart of Ancient Rome: the Roman Forum. Here was where Rome ruled its empire of untold political and cultural influence—and of more than 2.5 million square miles and 65 million people. Stroll beneath the Arch of Constantine, see the Senate house, where toga-clad elites decided on behalf of all of those millions, and learn the story of the Temple of the Vestal Virgins, where a special cult of women kept Rome’s sacred flame alive. Your guide will bring Ancient Rome to life with tales of love, betrayal, and larger-than-life characters (Caesar, Cleopatra & Mark Antony to name a few), with great visual aids and reconstructions to show you how it all would have looked 2,000 years ago. At the Palatine Hill you’ll discover the origins of Ancient Rome. Legend has it that this is the spot where Remus and Romulus were found by the she-wolf and where they battled to decide which would have the privilege of building their own town. Hear how this legendary battle impacted the world you know today (your very own life even!) We owe the Ancient Romans more than you’d believe! Traveling in such small groups means you’ll find it easier to get around busy sites, and to hear and engage with your guide. A good thing too, since they’re some of the best in the business. To help you get the most from the time you spend with us, we also have privileged access at the Colosseum, Roman Forum and Palatine Hill. So you won’t have to wait in line. Because Colosseum underground tours are so limited, this tour often sells out months in advance. Book now to be sure that you secure your place! A number of our Colosseum tours have special access too, including our VIP Caesar's Palace Tour, which has exclusive access to a 2,000 year-old palace on the Palatine Hill; our brand new Hard Hat Tour which visits the working archaeological site of Nero's enormous Golden Palace (Saturday & Sunday only); and our Gladiator's Gate Tour, which gets you onto the Colosseum arena floor (one of the special access areas visited on this tour) at a much lower cost. The tour and the guide of the Forum, the Palatine Hill, and the Colosseum were exceptional. I would not have been able to impart Â½ of the info to my 13 year old grandson who liked especially the animal cage in the underground section of the colosseum. The tour was very good and covers almost everything, I say almost because it only goes for so long and you can not cover everything which I understand. nonetheless, it was great. thank you and Davide very much, he was full of great information and answered all questions asked. We thoroughly enjoyed the Underground Colosseum tour. Our guide was personable, informative, and entertaining. Hilary was wonderful!! My family of 5 really enjoyed our tour with her. So much amazing information and a great guide. Thank you. We found Tiberio to be a most excellent guide. His knowledge of history, languages and the sites was astounding and inspiring. I heard him speak to others in French, Spanish, Italian (of course) and to our group, in English. He was warm, engaging and entertaining. I count ourselves lucky that he was our guide and I enjoyed his passion for his city, country and their histories. Please keep in mind that the Colosseum is subject to unforeseen closures due to weather conditions and worker strikes, as well as last-minute changes in reservation procedures, all of which are out of Walks of Italy (or any other tour operator's) control. If for any reason we cannot run the tour as described, we will contact you immediately, offering the best alternatives. Depending on the situation this might result in a modification of the itinerary or a change in the tour start time. Unfortunately, due to stairways and limited elevator access in the Colosseum, we cannot accommodate guests with mobility impairments or strollers on this tour. Please contact us at info@walksofitaly.com and we will work with you to find a suitable alternative. THIS TOUR RUNS RAIN OR SHINE. This means that in the winter you should wrap up well on cold days and in the summer you should wear plenty of sun screen and bring a refillable water bottle with you. It's a long time under the hot Italian sun so please come prepared.